Time For A Typewriter Renaissance? IT WAS 4 P.M. ON A THURSDAY, two hours until the end of Jesse Banuelos’ workday. He was standing behind the front counter of Berkeley Typewriter, his trademark green apron tied around his waist. A dozen broken typewriters — some electric, but most of them manual – were stacked in a corner on the brown linoleum floor. Forty years ago, the shop was at the top of its game. But during the ’90s, as computers became more affordable, fewer customers bought typewriters or needed them repaired. Many typewriter stores went out of business. Berkeley Typewriter laid off some staff and managed to remain open by offering services like printer, photocopier and fax repair. Banuelos is the store’s only remaining technician who knows how to fix typewriters. He never learned how to type on a computer and for a time he worried that the typewriter industry would soon disappear. He was wrong. In the last few years, both typewriter sales and repairs have increased at the store. 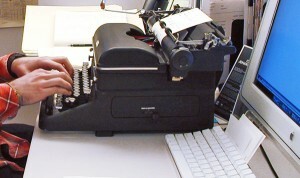 Berkeley Typewriter experienced an increase in overall sales in 2011, moving about two or three a week. It’s not like the olden days, Banuelos said, but it’s enough. Most of the typewriters that he sells or takes in are manual machines made between the early 1900s and the 1960s. The dozen or so brands displayed in Banuelos’ front window read like a row of multicolored tombstones: Royal, Remington, Underwood, Smith-Corona, Olivetti, Corona, Adler, Oliver.